Format: import, pal, full screen, gift box, limited edition collection. Average Customer Review: 2.2 out of 5 stars 16 customer reviews. Subtitles: Dutch (fixed part) this luxury box located at 25 dvd gathers for the first time most of the works of funès. Definitely a must for fans of the master of French comedy. Movies: - a mouse among men = a funny caid. The adventures of rabbi jacob. Louis de funes intiem (documentary) - the big mop. The little bather - the corniaud - pouic-pouic - the miser. Very limited stock at our supplier "no additional stock warrant due to high demand" only available for a very limited time !! with our shop, forget about the stress of late deliveries (see our reviews). Our partners are committed to delivering your parcels as soon as possible, quickly, easily and efficiently! Some products are not deliverable by mail. Corsican, overseas, Guadeloupe, French Guiana, meeting and the Canary Islands in Spain. Thank you to send us a message before ordering so we can confirm the delivery or not! To all addresses other than apo / po boxes in France and Belgium. Our stocks are in warehouses based in France. All orders are shipped via DHL, post, chronopost or ups (depending on location and package weight). Unless otherwise stated, all orders will be shipped within 48 hours of the date of your payment. Check our positive reviews to see the good reviews on the speed of our deliveries that we offer. To all addresses other than apo / po boxes in the lower 48 states, france and belgium. Our stock all ships from our france-based warehouses. If you are not delivered or the item does not match its description, they will refund you and help you find a solution with us subject to conditions. We offer a 30 day return policy for our products. We are behind our products. Items can be returned to us for exchange or full refund within 30 days from the date of receipt of your merchandise. We are not responsible for any purchase after this 30 day period. Return shipping costs are the responsibility of the buyer unless return is the result of our error. We pay the referral fee if an exchange is requested. If you have any questions please contact us by "ask a question to the seller. We will reply you within 1 business day or less. All returns must be made within 30 days from the date of purchase and only with our return label! Please note that we can no longer refund after the 30 day limit. When returning, please note that it may take up to 7 business days for the return to be processed. We do our best to treat as quickly as possible. 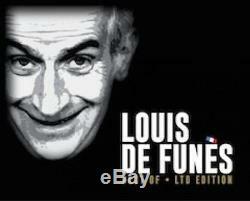 The item "louis de funès best of box 25 dvd limited edition collection" is on sale since Thursday, September 6, 2018. It is in the category "dvd, cinema \ dvd, blu-ray". The seller is "ddstores1" and is located at / en fr. This item can be shipped to the following country: France.